The Speed 5 is a tribute to the heyday of gentlemanly British cycle racing. 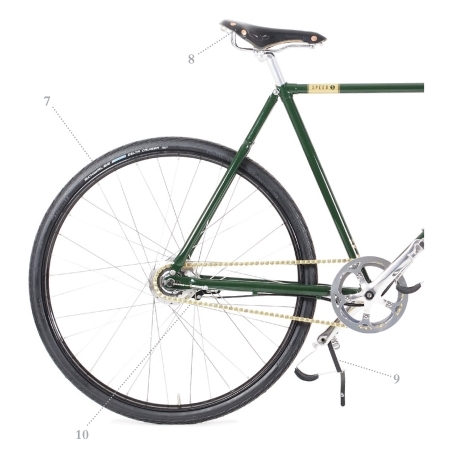 Have you found the Pashley Speed 5 Green Cheaper? This was a time when riders would come together in the noble pursuit of record-breaking times with only the satisfaction and thrill of success for reward. It embodies all that was great about this era, allowing you to follow in the footsteps of these men in your own exciting cycling endeavours. Semi-drop classic racing handlebars: Swept-back, high-strength stainless steel bar for confident handling whilst racing. Finished with GB anti-slip diamond patterned silcone back handlebar tape. Powerful fully-enclosed hub brakes: hub-brakes provide reliable stopping power come rain or shine (90mm front, 70mm rear). Enclosed and sealed from all-weathers, these brakes are low maintenance and robust. Frame Traditional lugged and brazed construction with authentic 1930s geometry. Scalloped lugs and Reynolds 531 butted tubes. Individually hand-built. Saddle Brooks black Swift natural leather saddle with chromed steel rails. Handlebar Semi-drop bar on a forged alloy quill stem. Brakes Sturmey Archer all-weather, low maintenance front (90mm) and rear (70mm) hub brakes. Wheels Gold lined black alloy Westwood rims with stainless steel spokes. Tyres 28x1 1/2" Black Schwalbe Delta Cruiser tyres with puncture protection. Pedals Alloy body with toe clips and black leather straps. Crankset Sugino polished alloy crankset (46T, 170mm) with guard. Other Features Micro-adjust alloy seatpost, brass bell, GB anti-slip diamond patterned silcone back handlebar tape, golden chain, Race number, GB wingnuts. Frames Sizes 20.5", 22.5" and 24.5" (double top tube frame). What do you think of Pashley Speed 5 Green?